The 2016 London Print Fair is now on running from today, Thursday 5th May until Sunday 8th May with more information available at http://www.londonprintfair.com/. If you are in the market for, or want a good look at an amazing selection of top class prints then it’s definitely worth a visit. Last night I went to the Press View; and the quality and variety of works present was frankly exceptional. A couple of images will have to represent a complete box of delights; it wasn’t easy to choose but both show the high standard of items available. While nothing there is really cheap, there are a remarkable number of items that represent good long term value. Two acquatints each immaculately printed in red and black from two separate plates,by George Baselitz and shown by Till Verclas, were on offer for around £3,000. If your taste runs that way to modern German art, they seemed relatively inexpensive. Christopher Mendez has several good dark early states of Piranesi’s Veduti di Roma at somewhat over over a thousand pounds and a really fine impression of a print of Poussin’s Landscape with Funeral of Phocion was significantly under half that. Andrew Edmunds, likewise located just inside the main entrance to the left as you come in, seemed to be doing very good business indeed with an epidemic of red dots covering much of his stock after half an hour. An exceptional item was Gillray’s The KING of BROBDINGNAG, and GULLIVER (image below) in wonderful and brightest early colour, not especially cheap at around £8,000 but frankly when are you going to get one as good? It was unsold, although attracting a lot of attention from potential buyers, when I left last night.Whether it remains available today is an open question. There were also plenty of very fine items for more serious money. Some of the Grosvenor School lino-cuts, printed in colours by Cyril Power and Sybil Andrews, were selling towards the top end of the tens of thousands of pounds. Gilden’s Arts Gallery had a nice large Miro for around £20,000. Osborne Samuel had some prints from Eric Ravilious’ submarine series in very attractive fresh condition, although for non- trivial prices around £12,000. 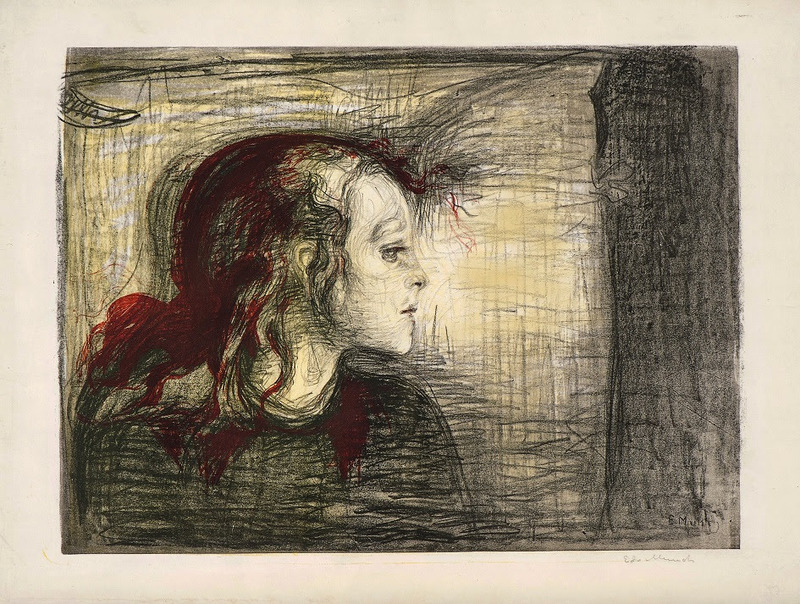 Finally there is just room to mention and illustrate below, a superb (but very definitely ‘price on application’) four colour lithograph of The Sick Girl by Edvard Munch shown by Frederick Mulder. I wish, if I win the lottery! Last Saturday we decided to have a treat and call it our works outing. Jane and I visited the Garden Museum Plant Fair, which this year was held in the gardens of Lambeth Palace since the Museum itself is being redeveloped. The day was a resounding success. The fair had an awful lot going for it. For a start the trade stands were of the highest quality, full of fine and original plants at very fair prices. The exhibitors were those one hoped and indeed expected to see, people who knew and cared about plants and had brought along their best stock for a knowledgeable and often passionate group of gardeners. Just three of the many names give you an indication of the standard: Derry Watkins’ Special Plants, Rose Cottage Plants and Crug Farm Plants. The plant stock was obviously rather spring-centred with lots of bulbs. One of nicest things was the proliferation of twists on old favourites. Thus I bought a wallflower from Special Plants as a present for a neighbour but it was Erysimum ‘Red Jep’ rather than some random bit of a Persian Carpet mixture. Described as ‘Deep velvety red with a touch of orange’ its best quality is the way it actually enhances the plants next to which it is put. It’s ended up in a border at the Old Vicarage surrounded by forget-me-nots and what I call Sarah Raven tulips such as ‘Cairo’, ‘Abu Hassan’, and ‘Queen of the Night’. Frankly it looks great whereas even good plants of that trusty favourite Bowles Mauve merely look good. And at £3.50 it could hardly have been cheaper. Something else interesting and very fair value was a pot of Fritillaria acmopetala for £6 from Rose Cottage plants (see the picture). Nearby, Crown Imperials have always been old favourites but ‘William III’ with its bronzy flush is a distinctive and distinct improvement on the ordinary red specimens. There were fine offerings of garden furniture in steel and splendid old garden equipment including a proper, large, half moon edger in good and useable condition for £32. A couple of the obligatory cucumber straighteners looked fascinating (if the price of these goes on rising as it has they’ll soon be worth a forger’s attention!). Mari’s excellent pop up cafe not only served very good food but by a miracle did so very quickly; even keeping pace with swelling queues of the visitors sent scurrying by occasional showers into the catering marquee. Perhaps the thing that made the Fair special though was the setting and atmosphere with loads of room to spread out in Lambeth Palace’s eleven acres without the usual crush you get at these events. It’s London’s oldest continually cultivated garden, dating right back to 1197 and is infinitely grander and more pleasing than anyone who hadn’t visited it before would imagine. Until recently it was remarkably difficult to visit. However the present Archbishop, Justin Welbey, has moved to open it not only for special events and groups, but to the general public. It’s open on the first Friday afternoon of each month between March and October this year. You enter the garden, once you have passed through the ancient gatehouse and an enclosed courtyard which contains an ancient white fig on its left hand side propagated from an original planted in 1564. Such reminders of the place’s age and history are everywhere while the atmosphere, despite some noise from outside the high enclosing walls, is tranquil and relaxed, completely contrasted to the bustle and roar of traffic from the encircling roads. By turning through a narrow passageway between ranks of buildings you come suddenly into a huge expanse of green composed of lawns, trees and borders and bisected by a broad stone walkway raised a few steps above the general level and ornamented with pergolas, benches and planting. In the large lawned area beyond this walkway the plant fair had spread out its stands. Beyond this again there are many surprises, including a secret grove, lake, beehives and a gravel garden along with other delights. A Chinese garden for example contains rarities including a plant we were quite unable to identify initially. It turned out (thank you helpful label!) to be Dipelta yunnanensis, one of George Forrest’s introductions from Western China in 1910. It looks a bit like a weigela with corymbs of fried eggs for flowers and is nowadays scarce, although apparently hardy and is obtainable from two or three specialists such as Burncoose Nurseries. All in all it was a delightful day and we voted the outing a great success. If you get an opportunity to visit the gardens do take it and there can be few better value plant fairs than this. A fiver covered both and it provided an opportunity to buy plants of distinction at prices rather less than you would pay for the most ordinary competitors in many garden centres. It would be really excellent if it was held there again next year.